Dan's Motorcycle "Hoping Up Your Motorcycle"
¶ Now believe me, I just LOVE to hop up an engine. However, the best advice I can give you is this... DON'T DO IT! Why do I say this? Because there is a better way. Sell your little bike and... Buy a bigger bike. To put it another way "Speed costs money, how fast can you afford to go?" 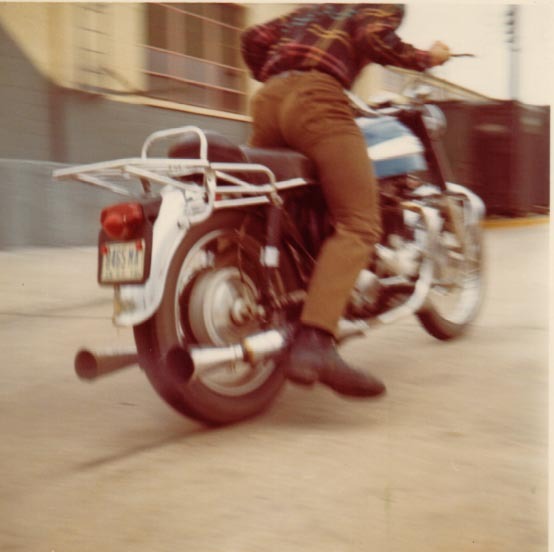 Everybody seems to think, "If I just take off the muffler and air cleaner, hang on a big carb, and fiddle with the tires, I'll go really, really fast." Maybe forty years ago this approach might have worked, maybe. But not now. Nowadays, everything is interconnected. If you change one thing you mess up the balance of everything else. But, you're not going to listen to me are you? Ok, let's go over a few things that might help. Bigger is better. The cheapest and easiest way to more power is to bore the engine bigger. I don't mean an oversize or two. Even the biggest oversize is only about 1 mm bigger in bore diameter. You need 3, 4, 5mm bigger. To feel a real seat-of-the-pants power increase you need a 10-12% horsepower increase. The best way to get this increase is with more cubic inches. This is true for both two and four stroke engines. Remember, you may have to put in a bigger main jet in the carb because you have a bigger engine. Next comes the intake and the exhaust. Here is where it can get hairy. Some engines respond well to an exhaust pipe change and some do not. Ask around and see what others with your type of bike have done. DON'T be the first on your block to find out what doesn't work. If you change the exhaust, make sure you can get lots of different jets for your carb. That is so you at least have a chance at making it run right if it doesn't work quite as well as the ad said. Don't throw out the old exhaust. If things don't work out, you can always put the old one back on. A carb change can sometimes help, but don't go too big. Now it is true that you can jam a gigantic carb on and you can make it work, but it will be a real job of work. I had a friend who put a monster Mikuni carb on a Honda XL350cc single. It was like 38 mm. A real monster. It was supposed to be pre-jetted... yeah, right, sure. He stayed with me for several weeks while he worked on it just like a regular job. Like 6-8 hours a day, every day. At night he poured over all my carb and carb parts books. 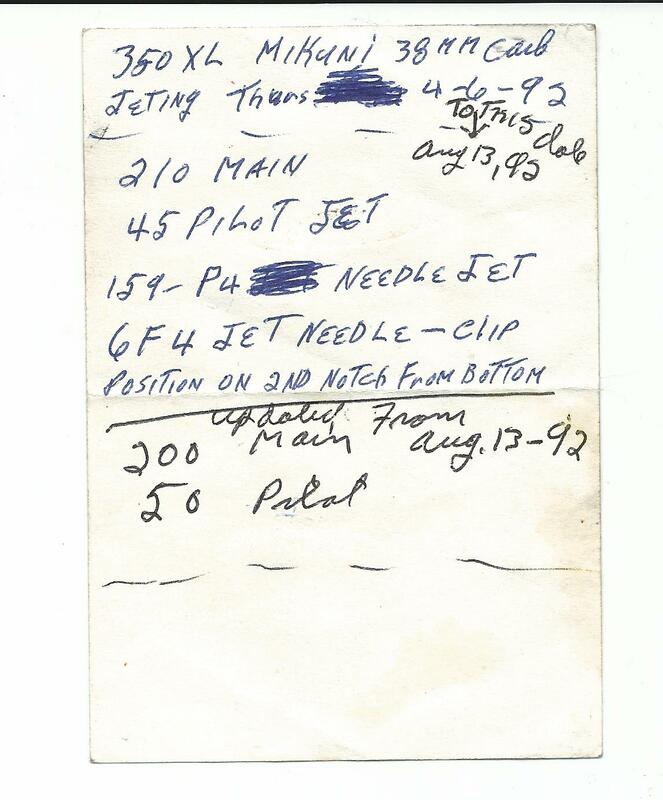 Bought a bunch of very carefully selected main jets, idle jets, jet needles and needle jets. It would barely start when he started and I got to admit it ran almost perfect when he finished... almost. Now, I don't think it had any more Horse Power than stock, but it did run pretty smooth. Over 100 hours of careful tuning, another $150 in parts (at wholesale prices, no less) and all we can say is that it runs smooth? I don't think it was worth it. Who knows... maybe it will be worth it to you. 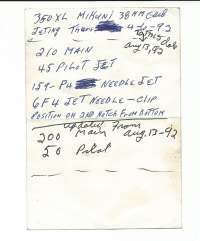 He wrote down all the specs and left them with me if you are interested. If you have a four stroke you can put in a different cam and enlarge the ports and valves. A good polish job on the ports can help. A higher compression ratio can give a nice power increase too. Sometimes you can increase the stroke of the engine to make it bigger. However, this involves a different rod and repositioning the crank pin and sometimes grinding the mouth of the crankcase ... lots of work. One little cheap trick you can pull with cams is to grind the heel of the cam. That is, the part opposite the lob of the cam that pushes open the rocker arm. This enables you to tighten up the tappet a bit (but still keep the stock valve clearance) which will give your cam more lift, while retaining the stock opening and closing ramps. There is no pressure from the rocker arm on the heel, where you grind, so you don't have to worry if you grind through the case hardening on the surface of the cam heel. If you have a two stroke you can cut the height and width of the ports. You can also do this with the ports in the piston, if it has any. Go very slooow with this grinding thing. Enlarge things just a little, then put her together and go for a ride. If you like what you've done, you might want to leave well enough alone. Get greedy, go to far and you will loose everything. The right expansion chamber exhaust can make a really big difference in the horse power and in the power band of the engine. Sometimes weight added to the flywheel can help make the bike more rideable. Changing the reed valves (located right in front of the carb) to ones of better quality can give a power boost. You will find that many small changes, say one ratio up in compression, a slightly hotter cam, a slightly bigger carb, a little freer flowing exhaust. Stuff like that will work better than one or two big changes. All this will take a lot of time and money. Then, when you finally got all that horse power dialed in, it blows the clutch. You put in a stronger clutch, and it blows third gear. Fix that and the drive chain has to be bigger, and then of all things, there's too much HP for the rear hub. So you put one on from a bigger bike and it weighs more, and then... ! You get the picture? Not only that, when the clutch went I was doing 70-75 mph and it locked up the rear wheel. Pulling in the clutch didn't do one bit of good. I didn't fall off either and it was on asphalt too. To top it off the bike is now worth less money than a stock one. Why? Well, do you really think a hopped up bike was run real easy? Granny only ran it on Sundays against other old ladies in wheelchairs, didn't push it at all. Change only one thing at a time. That way if the change is good, you will know what helped. Conversely, if you lose power, you will know exactly what to undo. You will run into lots of things that you did not expect. I once put a hi lift cam in a 450 Honda twin. As I remember, it was a 5-speed and for some reason the circlip groove on the valve stem was machined just a bit lower than on the 4-speed valve and the little fork that closed the valve (it had torsion bar valve springs.) hit the valve seal at full lift, ruining it. If I used the valves off the 4-speed engine all was OK. Hmmm... maybe it was the 4-speed that was too short and the 5-speed cured it... it was a long time ago. Anyway, I ended up having to change out perfectly good valves. This happens a lot when you do hop-up. The factories call it research and development, and declare it on their taxes. What do you call it? Time and money... time and money. If you really have to do it, there are a lot of books out there. Get several and do your homework. Speed costs money. How fast can you afford to go? Copyright � 1999-2002 dansmc.com. All rights reserved.